Waterproof Menu Printing is Now Available! Waterproof Menu Printing is Now Available! Waterproof Printed Products has an alternative to expensive plastic menu printing or flimsy paper menus. WaterproofPrintedProducts.com offers our special Full Color Printing on Waterproof, Tear and Stain Resistant Paper. Plastic menus have a very high minimum quantity and cost associated with them. 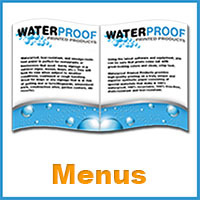 Waterproof Menu Printing offers a similar durability with a much lower minimum and cost. If you are looking for menus that have that extra durability, Waterproof Menu Printing is the perfect choice. No lamination needed! Our Menu Paper is innovative synthetic substrates that are specifically designed for outstanding high resolution imaging. Waterproof Menu paper is a new product that is perfect for Menu Printing. This product is durable, waterproof, tear resistant and stain resistant materials that offer the best characteristics of both paper and polyester. With Waterproof Menu Printing you get products that are waterproof and tear resistant for excellent durability, but what is very unique about our product is that it also can handle print finishing processes such as saddle stitching, punching, and folding just like paper does. In addition, our Waterproof paper is very stain resistant to common foods such as mustard, tea, and red wine. Thus, if you catch a stain within a reasonable time period you can fix the problem by washing the menu with soap and water. Because you won’t have to laminate for durability and protection from spills, there’s no need to send the menus out to a laminating company saving you time and money. Plus, you won’t have to worry about the inevitable de-laminated scores, edges and corners that occur over time with laminated menus. Our Waterproof Paper is fold-able. Even the 10, 11 and 12 mil cover weight calipers can be scored and folded. This is very different than most other products, and a great feature for printing menus. The velvety soft feel of our paper is truly unique; add full color images and graphics to make your menu act as a unique branding tool. Our Waterproof Menu Printing is available in four calipers; 7.5 mil, 10 mil, 11 mil and 12 mil, allowing you to print both inside pages and covers of menus. The 7.5 mil caliper for the pages and 10, 11 or 12 mil caliper for the cover of booklet style menus. The Rigid stock is perfect for flat menus and cards. The Soft stock is perfect for menus that need to be folded. So whether it’s a saddle stitched multiple page menu, or a finished 8.5 x 11 folded menu, or simple flat menus our Waterproof Menus Printing is the new choice for business owners who are looking for a professional look at a very affordable price. ← News Splash! Waterproof Printed Products has arrived at Eveready!